The Symposium celebrated the participants’ successful completion of UNAOC’s Young Peacebuilders programme, implemented in collaboration with Generations For Peace. 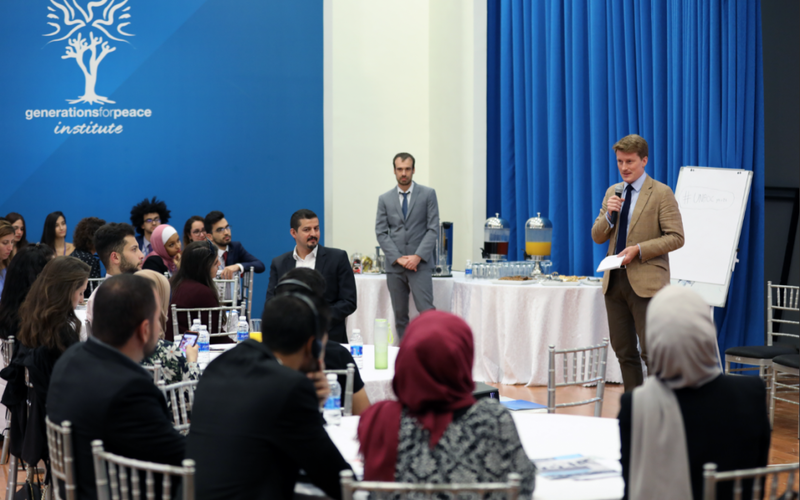 24 September 2018 – Amman/Jordan: Generations For Peace hosted 19 talented and committed young women and men from 12 MENA countries attending the United Nations Alliance of Civilizations (UNAOC) Young Peacebuilders’ Symposium from September 20-21. Those present have successfully completed UNAOC’s Young Peacebuilders programme, implemented in collaboration with Generations For Peace and with the generous support of the Agencia Extremeña de Cooperación Internacional para el Desarrollo (AEXCID). This peace education programme supports youth leaders between 18 and 25 in gaining peacebuilding skills while bringing visibility to their actions and projects towards promotion of diversity and dialogue. After an intense online preparation, which started in November 2017, these young peace leaders came together for a first time in February 2018 at Generations For Peace headquarters in Amman, Jordan, during a face-to-face-workshop in which they have strengthened their capacities in analysing conflicts, applying peacebuilding tools, and designing peace initiatives. Since then, each participant applied the knowledge and skills upon returning home during the implementation phase in which they received professional support from a skilled trainers team. During the symposium, the Young Peacebuilders had the opportunity to share their experiences, lessons learned, achievements, and recommendations with a broad audience of practitioners, UN staff, policy makers, civil society, and other experts. The event follows a February workshop put on by UNAOC and hosted by Generations For Peace, which aimed to continue its efforts to grow and strengthen the global movement of young peacebuilders. The United Nations Alliance of Civilizations has long recognised the important and positive contribution of youth and youth-led organisations in conflict prevention and peacebuilding efforts, responding to the United Nations Security Council Resolutions 2250 and 2419 on Youth, Peace, and Security, and the Secretary-General’s Plan of Action on Preventing Violent Extremism. For more information about UNAOC’s Young Peacebuilders programme, please visit www.unaoc.org or contact Bram Van Haver, Project Management Specialist Youth and Education: BramVH@unops.org.